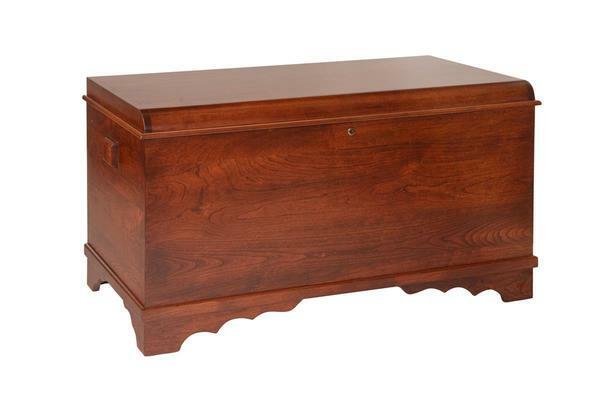 This Amish handcrafted Waterfall hope chest is proudly made in the USA of 100% solid cherry wood. The rounded top and scalloped foot make this a classic design for an Amish Hope Chest. As the years go by, fill this solid cherry wood hope chest with many treasures. Choose from our many design and options to customize the look for your new hope chest. This beautiful hope chest comes standard with a cedar bottom, castors and lock. Full cedar lining is also available as an upgrade option on this Amish hope chest. Jennifer, I am enjoying my new hope chest. After the gentleman left yesterday, I spent the morning organizing items and placing them in my chest. It is beautiful and has such a large capacity. I am so glad that I chose the jumbo size. My older granddaughter is 10 years old, and her twin sisters are 7. They love the chests! Their mother, my daughter, thinks they are beautiful!